An inspired Willian Chelsea side blitz pass a struggling Stoke City side as the Premier League champions put in a five star performance to pile on more misery on the Mark Hughes led side. It was a brilliant start from the Blues having take the lead three minutes into the game, Brazilian playmaker Willian fired in a set-piece from the right an unmarked Antonio Rudiger slotted in easily with an header. The hosts continued dominating proceedings as they doubled their lead in the ninth minute after a good cross from Pedro Rodriguez fell to Danny Drinkwater on the edge of the box, which he roofed into the top of the net with a fine volley. 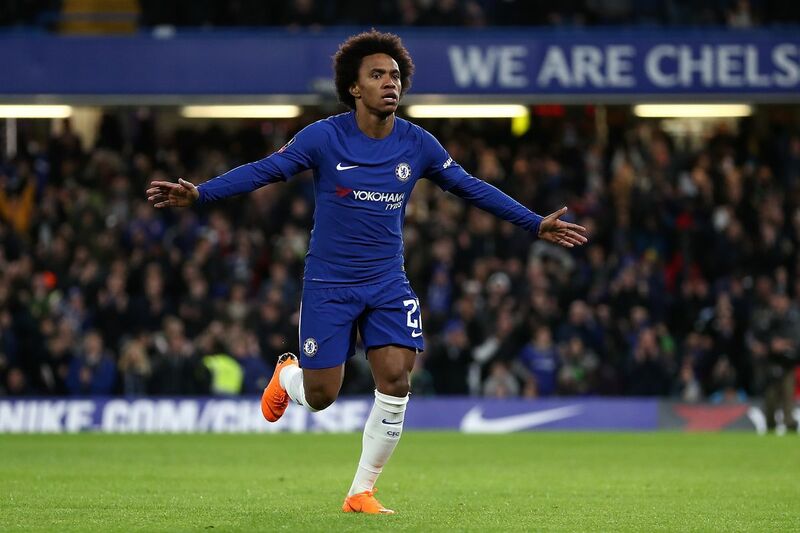 In the 24th minute, Willian was at the helm of affairs again as he turned provider for Pedro with a beautiful pass as the Spaniard fired past Jack Butland into the top corner of the net. The visitors tried to pull a goal back few minutes later via Mame Birame Diouf but his effort was ruled out for handball before record signing Alvaro Morata also spurned a good one-on- one with Jack Butland before the end of the first half. Struggling striker Saido Berahino could have ended his goal drought by pulling one back for the Potters but he was denied by Thibaut Courtois who have enjoyed a quiet afternoon. Attacking midfielder Willian finally got on the score-sheet in the 73rd minute as he scored the Blues fourth from the penalty spot after being brought down Geoff Cameron in the box. Substitute Davide Zappacosta capped off the Blues win in style after firing home a fifth goal in the 83rd minute having capitalized on a terrible header from Tymon. This result means the Premier League champions have leapfrogged rivals Manchester United into second place following the Red Devils draw against Southampton. The Blues will now end the year 13 points adrift Premier League leaders Manchester City.